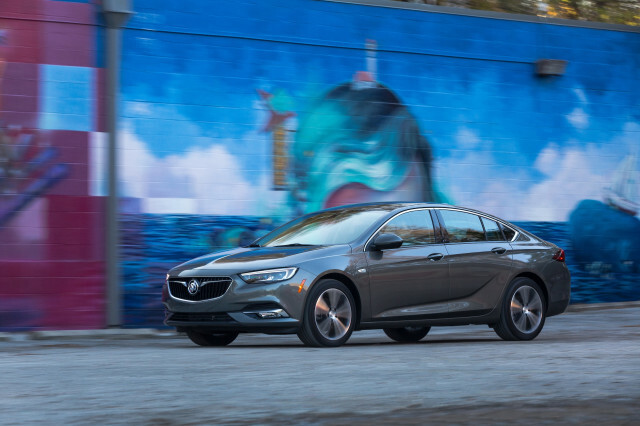 The decision to do away with a sedan shape and offer the 2018 Buick Regal as a hatchback (called Sportback) and a wagon (called Tour X) is an odd one at first blush. After all, mid-size sedans traditionally have been among the strongest selling vehicles, while hatchbacks and especially wagons have seen little success. But a funny thing has happened to sedans in the past couple of years. Sales of bread-and-butter mid-size sedans have fallen while crossovers have soared. Maybe it’s time to do something different. Maybe the 2018 Buick Regal Sportback is it. Buick says it wants to explore white space in the market. We wouldn’t say a mid-size hatchback is something entirely new. After all, Audi, BMW, Kia, and Porsche all have hatchbacks that are take-offs on the traditional sedan shape. However, the Regal Sportback isn’t as premium as those cars, and it offers more interior space. It’s basically a combination of a mid-size car and a crossover. Maybe that can win some buyers back to cars from the crossover craze. At a glance, it’s hard to tell if the Regal Sportback is a sedan or a hatchback. It cuts a profile similar to that of the new Honda Accord, which is a sedan. And yet, the rear hatch opens in one piece. The sculpting on the sides of the car is minimal, and a chrome trim strip traces the shape of the roofline, which Buick says has a coupe-like shape just to confuse the matter further. The grille takes on the look from the Avenir concept shown at the 2015 Detroit auto show. It is flanked by either full-LED headlights or halogen units with LED signatures. The sculpted lower fascia houses air inlets and available fog lights. While the Regal Sportback is a hatch in the vein of the Audi A5 Sportback, BMW 3-Series GT, and Kia Stinger, it is bigger than those cars and offers more space in its cavernous hatch area. With the rear seats up, it has 31.5 cubic feet of space, which is essentially twice the size of a mid-size sedan’s trunk. Fold those seats down, and you get a slope-roofed crossover in car form, with 60.7 cubic feet of cargo space. By comparison, the Mazda CX-5 has a 59.6 cubic foot cargo hold with the second row folded down. The Regal’s second row folds either in a 60/40 split or a 40/20/40 split on higher-line models for longer items like skis to fit while still carrying two passengers in the outboard seats of the second row. The second-row seat is also more spacious than what you’ll get in the hatchback competition. Despite the sloping roofline, head room is good for even those an inch or two above 6-foot, and leg room will work for a pair of Alan Aldas to sit in tandem. The news up front isn’t as good. Sure, it’s spacious and the seats are comfortable, but it’s hard to see how Buick is a premium brand based on this interior. The Regal is based on a newer version of the same Epsilon II platform as the Chevrolet Malibu, and there isn’t much difference in interior quality between the two. Sure, the Buick has some soft-touch materials on the dash and the door tops, and the look is cohesive and attractive, but everything belly-button level and below is hard plastic, and the plastic in the test cars at the media drive in Austin, Texas had some untrimmed flash in a few out-of-the-way areas. Ergonomically it’s decent, but it could use more space to stow cell phones, keys, ham sandwiches, and the other detritus we carry every day. That space is limited to a wireless charging mat at the base of the center stack, a pair of cupholders on the center console, and a good sized center bin.